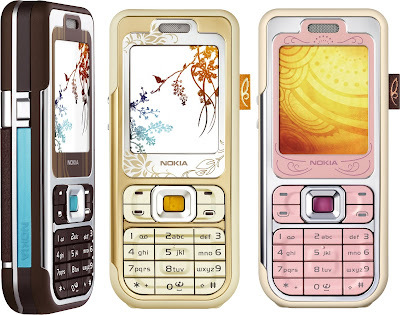 A decade ago, Nokia had a reputation for making practical if slightly dull mobile phones. 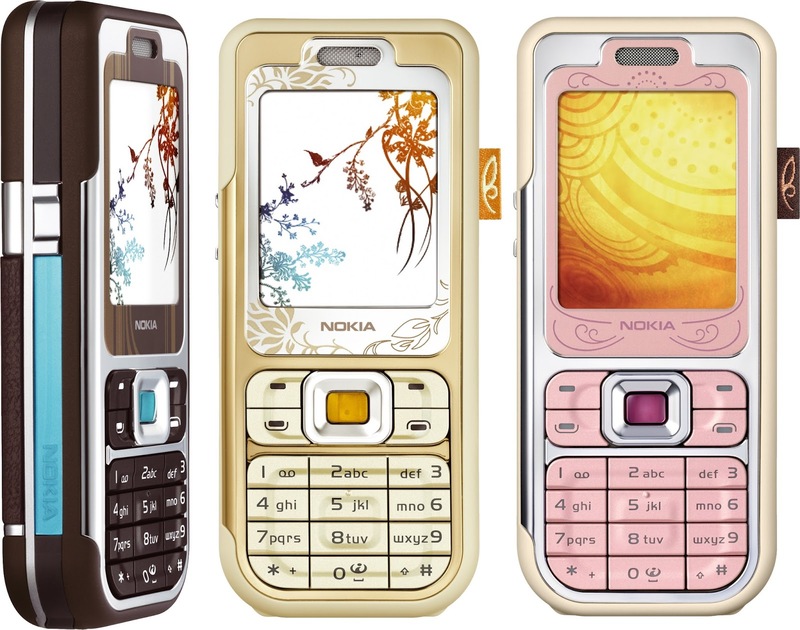 But occasionally the Finns liked to let their hair down and produce something different... and the Nokia L’Amour range from 2005 was certainly different from the norm. 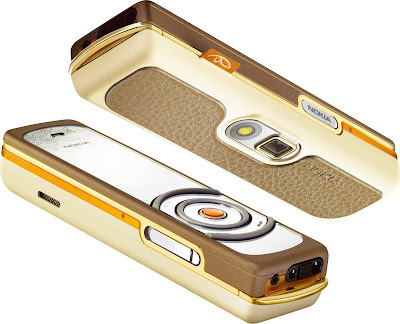 The range initially comprised of three phones: the Nokia 7360 monoblock, the 7370 rotator and the 7380 “lipstick” phone. All of these phones featured a patterned case, and had a little fabric label sticking out of the side to mark it out as a fashion item. Out of these, the 7360 was the most straightforward being a fairly basic but quite attractive device in four colours (brown, amber, pink plus a black/chrome combination for the boys). It only had a 128 x 160 pixel display and a VGA resolution camera, but it did come with an FM radio. The next model up was the 7370 phone with a rotating screen, featuring a much better QVGA display and camera. You could operate most of the functions of the phone with the keypad hidden, and this was a much more “girlie” device than the somewhat gender-neutral 7360. Rotating phones were always quite rare compared with sliding phones of the same era. 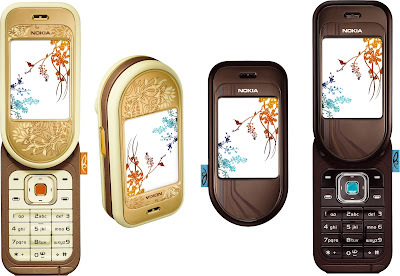 Topping out the range was the Nokia 7380, in an even more unusual format “lipstick” or “pen phone” format. Nokia had made a similar device the previous year, the art deco style 7280 but the 7380 had a better specification and a more feminine design than its predecessor. The 7380 didn’t have a keypad, but instead the main way of using the phone was an iPod-style rotator. The small 104 x 208 pixel screen had a mirrored finish, so you could do a quick lipstick check with it if you wanted. There was a 2 megapixel camera and it had an FM radio like the rest of the range. It looked brilliant. Admittedly, it wasn't the easiest thing in the world to use. But it looked brilliant. Despite the minimalist feature set, the 7380 was longer than the 7360 (although much narrower) and almost as heavy. But the 7380 (like the 7280 before it) is a device with a phenomenal amount of “wow factor”. Priced at €500 before tax and subsidy at 2005 prices (the equivalent retail price today would be about €750 or £550) the Nokia 7380 was quite an expensive device for something with such limited functionality. It's worth noting that Siemens had tried and failed with a similar approach with the Xelibri series launched in 2003 and dropped in 2004, and those were half the price of the Nokia. Both the 7380 and the 7280 that preceded are both rare and desirable handsets today with current prices upwards of about €130 up to €400 depending on condition. The other two devices are more commonly available with prices starting at less than €50. These radical designs certainly make an antidote to the slabby smartphones of today.. perhaps some daring manufacturer would like to revisit the concept?